Shadowspear Boxed Set...Multi part, or not? 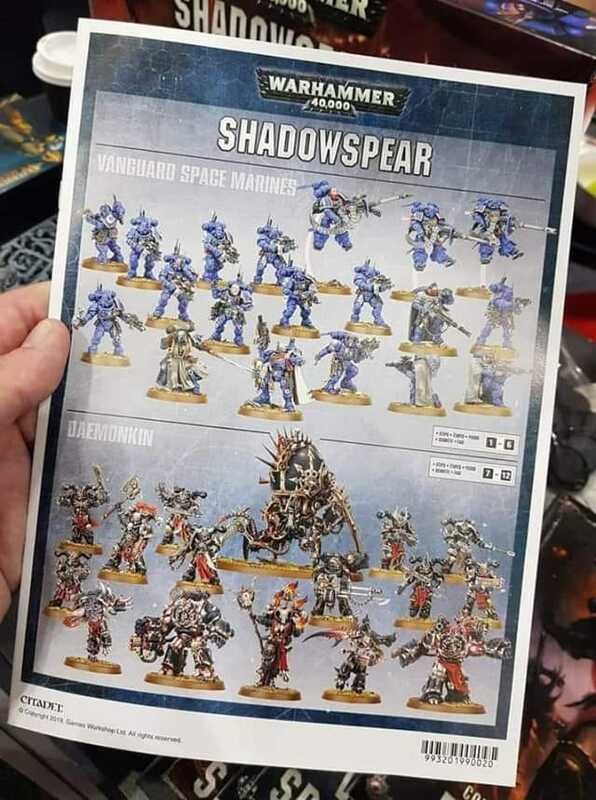 The Shadowspear miniatures are they? Subject: Shadowspear Boxed Set...Multi part, or not? So with Shadowspear a month or so away a bit of friendly discussion has popped up on the news and rumours forum. Are the miniatures multi part plastics or monopose sprues? They look monopose to me but I am not certain, so for a bit of fun have your say. Depends on if it's coming with a Rulebook or not in my opinion. TaC and WtD, both came as multipart sets without a book. If it is a psuedo-starter set, and comes with a Rulebook, they will be monopose. Are we counting the characters in this? Because they are obviously going to be monopose like almost every character for the last few years. Im not 100%. The marine models say monopose to me, because of the cloaks.....however, the CSM models seem very much multipart. The Oblits and characters are very much not multipart. It could be both! Id like to see whatever the "other" intercessors in the picture with the chest gear would look like too. I think the thing that initially got me thinking that they were monopose was the bolter CSM being extremely similar to the ones found in Blackstone Fortress. And GW can do amazing things with such sprues now. But we will see, not really fussed either way am just exuberant to see updated Chaos miniatures. As it will be part of vigilus there will already likely be a rulebook, so I bet multipart. I voted a bit of both. I think it will be that hybrid multipart like the Plague Marines box (not the one in Dark Imperium): You'll get "multipart" but will have to put certain pieces together to make certain distinct poses, which will lead to duplication of poses if you buy more than one box, rather than be able to actually make each model slightly unique if you wanted to like you could in the olden days. WC said it's a box in line with Wake the Dead etc so that would definitely mean multipart models which could later be released seperate (see GSC Aberrants). But I highly doubt that the kits will have much going for them in lines of posing. Well in the artwork there seems to be an obliterator with melee options, so I am voting multi-part. Looks to me like the Obliterators will have Mutilator options. The CSM have different weapons in the preview pics, so definitely seem like they will be multi-pose (Probably like the Plague Marines) sort of. Hell I am hoping my Space Wolves buddy will go halfsies with me on the box set. I don't even play CSM, just Death Guard, but I want the mocdels to paint! Sadly I doubt it will be. Hope I am proven wrong however. It will probably be more along the lines of DI in terms of posing. But one can always grab a knife and convert. Multipart but monopose. With a few weapon/wargear options if we're lucky. Characters will very likely be mono-pose and torsos on all of the marines will likely be connected to their legs in only one way, but things like arms and heads will likely be swappable. In other words, they won't be snap-fit Easy to Build, but they'll likely follow the same theme as we've seen with the rest of the Primaris and Death Guard releases. Looks like today's the day that we find out. I think they will be likes DI. Monopose, the CSM dataslate has a specific loadout per model count, it wouldn't have that if its not mono. Yet there is the errant CSM with a meltagun as well. Revised thinking. Characters definitely mono. Primaris mono. CSM troops multi as they will form part of the CSM standalone troop box. Even more so thinking along these lines as when GW were asked this question directly they said "wait and see"
They say wait and see to everything. Possibly the CSM troop set will be both a mono pose and a multi part set, like we got with the Plague Marines in Dark Imperium and an individual release. I can't say. I don't know what to look for when I see the pictures to say one way or the other. However, I honestly don't know why GW would waste time making mono pose troop choices where differnet weapon load outs are a thing. Could be I don't see any value in easy-to-build models as I never had much of an issue building regular ones. However, given the cost of making hard plastic molds, I wouldn't bother as I think the sales would be greater for a customizable kit since a customer is much more likely to buy multiples of the kit. But what do I know. I will say that the CSM part of Shadowspear does kinda feel like an appetizer. While the amount of CSM are enough for whatever, and I wouldn't expect more than one vehicle and HQ unit, the possessed and obliterators seem like just enough for a CSM player to want to pick up a full kit should they become separate releases as to field a decent enough of them to be worth it. Assuming that the rules for them are good enough to bother. Subject: Re:Shadowspear Boxed Set...Multi part, or not? I think it'll be a mix. I'm betting the CSM, Oblits, and some of the Marine units will be multi-part, if only because we saw a GW Rumor Engine photo of a Chaos heavy bolter. The characters will all be monopose though, because apparently GW thinks customizing characters is suddenly bad. "Monopose" is the wrong wording here. Multipart kits can still be monopose. Full kits--or at most the CSM might be missing a sprue for something else. These posings for the Primaris? Not sure why anyone is surprised. Look at the Reivers or Intercessors--you're seeing 5 pairs of the same bodies as the 10 man squads are the same set of sprues doubled up. To me it is clear that the Primaris side is monopose, see the six identical scouty dudes, 2 identical sniper dudes (bar different heads) and 2 identical floaty fire hose guys (bar different heads). To me a different head option still makes them monopose, YMMV. See also the multi part Inceptor kits, no shared body in that three man kit but here we have them with the grav chute and sniper guys. I see no repetition on the Chaos side, still does not mean that they are not monopose though. Primaris infantry usually have monopose leg/torso combos and separate monopose arms for any two-handed weapon that can be swapped between torsos; I don't expect it'll work that way for the sniper guys simply because of the constraints of the cloak but that's probably what the carbine squad and the autocannon squad will do. Has the box set price been released yet? Indeed, GW confirmed via Facebook that shadow spear is easy build just like DI. But the did heavily imply full kits to be coming soon. My first thought when they announced this a few weeks ago was going to be a DI model - start off as ETB and then in a few months release the full multipart kits exactly how DG were staggered out over a few months. They'll be monopose but the vehicles will be multi-pose I think. Killed any interest I had in the box. I'm getting more and more bored with GW releasing units with zero options or alternatives. I read that the chaos marines have a data sheet that is specific down to the model of how many have bolters, chain swords and they only can take a plasma gun? Hell, they couldn't even be bothered to give each primaris marine a unique pose. I imagine the actual CSM BOX will include more options. this is just the contents of shadowspear which is basicly "Dark Imperium" esque.